GreenDisk makes recycling easy for all of your CDs, DVDs, VHS and audio tapes, pagers, rechargeable batteries, PDAs, inkjet cartridges and much more! For just a few dollars, you can ship in your own boxes, or for larger loads or company collection sites, GreenDisk will send you a Technotrash Can in which you can ship them up to 70 pounds of electronic waste. Your fee for the Technotrash Can covers the cost of the box as well as shipping and recycling fees. 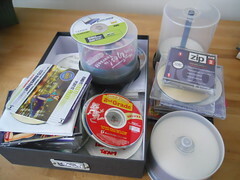 This entry was posted in Media and tagged green disk, recycle audio tapes, recycle cds, recycle dvds, recycle vhs tapes. Bookmark the permalink.